Wee Wooper! Pokemon One a Day, Series 2! 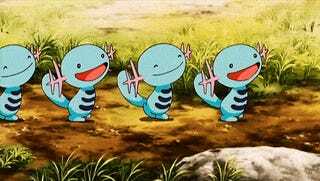 Wooper, I forgot how KYUTE you are! Even though you evolve into the dumbest lamest thing, you are so damn cute omg i'm ded and cant even no morez. 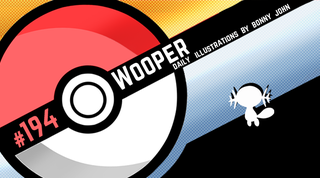 Today, I tackle Wooper in a sort of storybooky kind of style with a guest star- Lotad! Not very often does this happen on One a Day...But I think it just works for telling a little story! Generally speaking, One a Day devotes one illustration to the subject of the day. I've made exception before very very rarely, and even after I came to enjoy the idea of throwing Lotad into the mix and fleshing out the work to completion, I was hesitant to release it. But then I realized, what's the big deal? My approach to gen 2 is just to chill out more, continue to have fun and try out stuff I missed the first time around. Lotad is used to convey Wooper's expression which takes center stage so it becomes more of an accessory. Painting all of this was very simple and straight forward, and focused on Wooper while concealing Lotad to the background. I gave Wooper the expression first, and found out that the official Wooper art had a similar expression. I thought it looked cute after exaggerating the body, and wanted to keep it, so I sought to give it a reason. Instead of looking at something, I thought to tell a story of him sitting around and then realizing something was happening out of his control. Enter the Lotad! Creating the tiny little pool to help cement in a background of sorts was fun and helps create a nice atmosphere with color for the tonally painted subjects. And then, like I said before, it was about deciding to send out an illustration with two characters that I over though and now here we are!